The second 2019 release on Seilscheibenpfeiler is reserved for one of the most unique producers of our times and marks the label's most experimental moment yet. Peder Mannerfelt's discography stretches back more than ten years to when he ?rst started putting out techno records as The Subliminal Kid. Amongst other things he helped producing two acclaimed albums by fellow Swedish artists Fever Ray and gained recognition under his real name, especially in recent years with releases for Numbers. or Hinge Finger and critically acclaimed albums like 'Controlling Body' (2016) or 'Daily Routine' (2018) on his own imprint. Last year Mannerfelt contributed to Modeselektion Vol. 4, now he's back with a set of four tracks following his unique strain of abstract techno. 'Life Without Friction' is about disruption as well as peculiar moods and rhythms, and other than its title may suggest, there's a lot of friction and tenseness in these tracks. The title cut and 'Un - Air' show Mannerfelt in almost straightforward mode, always ensuring it never gets boring or too comfortable. 'Lucid In The Sky' and 'Hold The Line' combine mellow sounds with stabs of noise and twisted percussion. 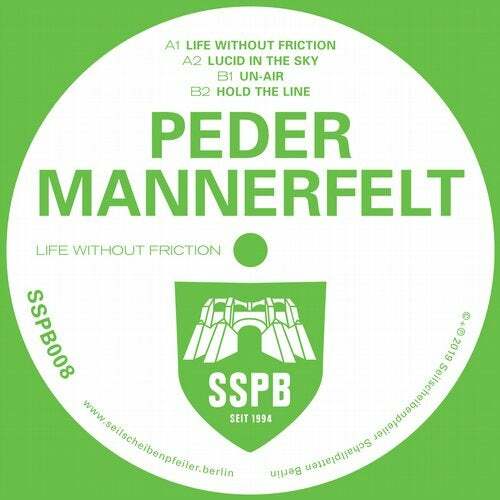 As always, Peder Mannerfelt's productions remain unpredictable, but predictably great.